In 1608, this area was first visited by Captain John Smith. The area was inhabited by Native Americans and when Captain Smith attempted to land here he was fiercely driven back to his ship. It was a Native American village and so he gave both the river and the village Native American names. The river became the Rappahannock, which meant "rise and fall" of water, and the village, set upon it, became Tappahannock, which means "town on the rise and fall of water". In the mid 1600's, a trading post was established by Jacob Hobbs. For a few years the area was known as Hobb's His Hole and later as New Plymouth. Eventually, the original name was returned in 1705. 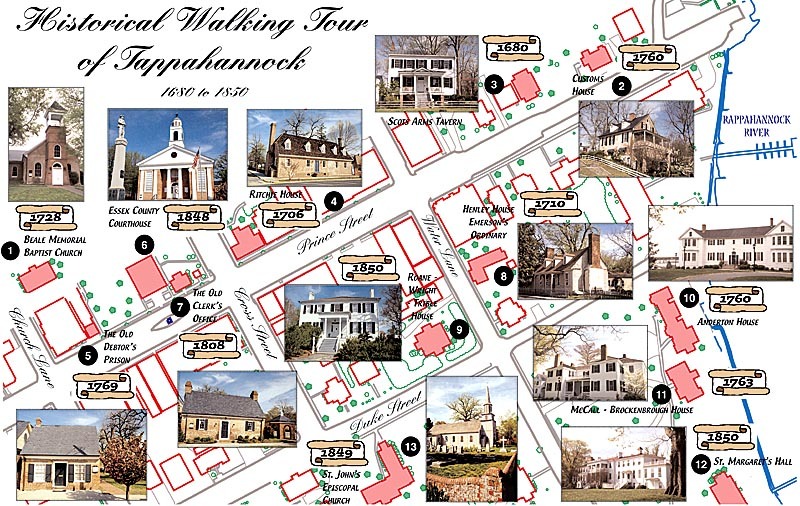 On and around the water still remain thirteen homes and buildings from these early days of Tappahannock. 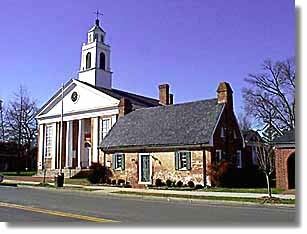 The Town of Tappahannock was established by Act of the Virginia Legislature at James City in 1680. The Town was laid out in half acre squares which still bear the original numbers and its wide and straight streets still retain the original names. To the original 68 lot numbers eight "slip" lots were added to make the Town border on the Rappahannock River. A "Square" bounded by Prince (Main), Church, Queen, and Cross Streets was set aside in 1680 for "the Publick Use" and on this square are located four of the "Landmark" buildings. Beale Memorial Baptist Church (the 1728 Court House), largely Greek Revival. The 1728 courthouse contains the original walls of the old courthouse. In 1875 the Tappahannock Baptists organized Centennial Baptist Church The building had been the scene in 1774 of the trial and sentencing to jail of four Baptist ministers for "preaching and expounding the Scriptures contrary to law." Customs House: early 1800's, at the foot of Prince Street. Archibald Ritchie owned the lot. At the site, John Whitlock operated Whitlock's Ordinary in the 1760's and 1770's. It is now a private home. Scots Arms Tavern, c. 1680, the oldest building on the tour, has been owned continuously by the Derieux family for more than a century. It is now a private residence. Ritchie House, c. 1706, at the northeast comer of Prince and Cross Streets, reflects Archibald Ritchie's leading role in Tappahannock in the decades before and after the Revolution. The ornate paneling in the house was removed in the 1930's and is on permanent display in the Tappahannock and Essex Rooms at the Winterthur Museum in Wilmington, Delaware. The house is now the law offices of Dillard and Katona Attorneys and may be open by appointment. The Old Debtor's Prison on the courthouse green next to the Essex County Courthouse was built prior to 1769. It now serves as the Essex Treasurer's Office. Essex County Courthouse: built in 1848 to replace the old courthouse, now Beale Memorial Baptist Church. A 1926 renovation added a bell and clock tower. The Essex Court House contains the oldest records in Virginia. James B. Slaughter's recent history of the area, Settlers, Southerners, Americans: The History of Essex County, Virginia 1608-1984, recounts in detail the county's 350-year-old story. The courthouse has long contained the largest portrait collection in the county. The Old Clerk's Office was built in 1808 next door to the courthouse. It is now the home of the Essex Women's Club. The photo to the right shows the Old Clerk's Office in the foreground along with the Centennial Fountain directly behind it. Henley House (Emerson's Ordinary), c. 1710. The original section had a center chimney and was probably built in the 1710's. The Emerson family began operating the tavern after purchasing the property in 1757. Grand fireplaces dominate both ends of the house. It is now a private residence. St. Margaret's School is currently saving an endangered gem of Tidewater history and architecture. The Brockenbrough House is undergoing a $750,000 historic restoration project with the help of Calder Loth, Senior Architectural Historian, from the Department of Historic Resources, Jody Lahendro, Architect PC, and Henderson Construction. In response to the building's needs the school hired Jody Lahendro to draft a conditions survey. This survey now serves as our map for current and future restoration with a keen eye on preservation. If you would like to know more about this house, please call the Director of Development at 804-443-3357. SMS remains committed to preserving this community anchor and looks forward to future community partnerships in education and facility sharing.